THREE BRIDGES, N.J. — Visitors got a glimpse of how horses are used in mental health therapies during Spring Reins of Life’s open house on June 3. Spring Reins of Life is a non-profit , EAGALA (Equine Assisted Growth and Learning Association) model program offering Equine Assisted Psychotherapy (EAP) and Equine Assisted Learning (EAL) which incorporates the use of horses for therapeutic intervention toward promoting emotional growth and healing. Due to privacy laws, no one is allowed to observe an actual session so volunteers were picked from the audience for abbreviated mock sessions. The team of professionals which includes psychotherapists and equine experts explained what was going on. There is no riding is involved. Instead the clients interact with the horses which are free to reciprocate — or simply walk away. During the demonstrations, the horses reacted differently to different people. After the session the volunteers were asked to describe their experience in one word. One gentlemen used the word "stubborn." He at first tried to get Mifi to come with him by using a yellow, plastic chain as a lead. Mifi walked way, repeatedly. Earlier though, Mifi allowed woman to get close to her, hand feed her grass and even walked alongside her. Christianna Capra, founder of the organization explained that using “clean words” was important in asking the clients about what they experienced. The idea is not to influence their thinking by choosing the wrong words but allow what they actually feel or think to come to the surface. The clients often project their own feelings when describing what the horse was doing and why. For example, instead of saying the client was walking with the horse, she would say they walked alongside each other. The word "with" implies a bond which may not actually exist. Maria Katsamanis, Psy.D, BCB, an EAGALA Certified Mental Health Professional as well as an EAGALA Certified Equine Specialist along with Erin Reyhan, LCSW, EAGALA Certified Mental Health Professional explained what they look for during the sessions. They said they look for patterns and changes in the behaviors or actions of both horses and humans. Spring Reins of Life provides services to military veterans and their families, bereaved children, at-risk/high-risk youth and addiction recovery. Danny Rongo, a singer, ordained minister and founder of the Dr. Onesong Foundation http://dannyrongo.com/the-dr-onesong-foundation/ provided entertainment and emceed the event. Also at the open house was Aravind Krishnan, a member of Boy Scout Troop 489 who is working on building a new shelter for the horses so they can have access to more pasture space. He needs to raise $5,000 for the project. He is holding a walkathon on June 16 at Ann Van Middlesworth Park in Hillsborough. For more information contact him at 732-614-7125 or aravindmkrishnan@gmail.com or his project coach at jkwirz@comcast.net. There is also a contest to guess when a momma donkey will deliver her next foal. The donkey and her baby from last year were rescued by the farm owner and given to Capra as a Christmas gift in December. It was not known at the time that the mother was pregnant again so her due date is anyone’s guess. The average gestation length in donkeys is about one year and donkeys can conceive again as early as five days after birth. Most commonly known as equine-assisted therapy, the use of horses for therapeutic purposes has increased significantly in recent years. "The process as we know it today was first developed in Europe in the mid-1940s," reveals Suzette Belgarde, an equestrian expert, and advocate of equine-assisted therapy from Faribault, Minnesota. Belgarde goes on to explain, however, that evidence exists of similar practices as far back as 2,500 years ago. "Therapeutic riding is documented in ancient Greek literature dating back to 600 BC, while modern documentation from Europe begins in 1946," she points out. Today, equine-assisted therapy is used to treat all manner of conditions, from traumatic physical injuries to anxiety, autism, and genetic syndromes. According to Suzette Belgarde, horses make particularly good psychotherapy assistance animals, owing to the fact that they can closely mirror and accurately respond to human behavior. "What's more, there's no judgment with a horse, and that's especially important for psychotherapy," the equestrian expert adds. As herding animals, horses rely on a constant stream of sensory data to determine safety or danger. Belgarde further reveals that horses can also hear a human heartbeat from around four feet away. "Studies have shown that horses actually have the amazing ability to synchronize their heartbeats with those of human beings," says Belgarde. She continues, "The unique connection between horses and people allows therapists to gain an invaluable insight into the inner psychology of their clients." 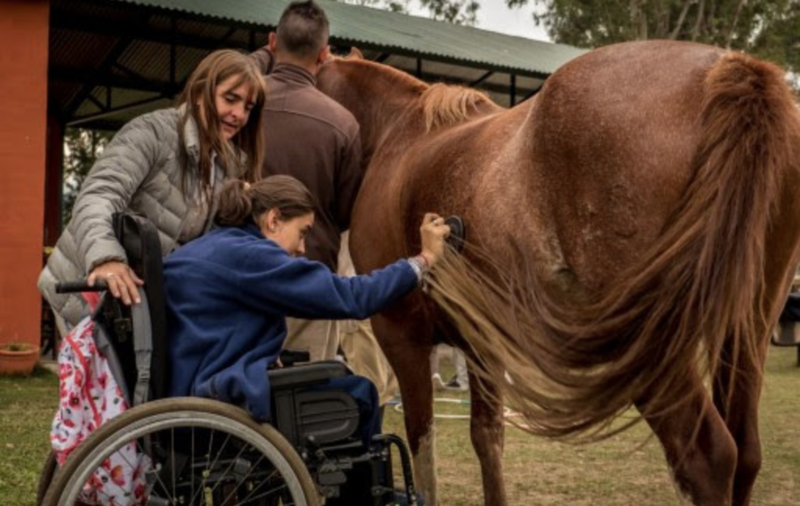 Equine-assisted psychotherapy has been shown to help with matters from self-esteem issues, to boosting confidence and establishing trust in others. Beyond psychotherapy, horses have also been used for therapeutic purposes surrounding cerebral palsy, developmental delay, and dementia. "Activities are generally tailored to promote physical, occupational, and emotional growth in individuals suffering from a wide range of complaints," says Belgarde. Other areas where equine-assisted therapy is documented to be highly successful include treatment of severe physical injuries, cases of post-traumatic stress disorder, behavioral and communication issues, substance abuse, and eating disorders. "It's an efficient and effective form of treatment, with equine therapy often yielding positive results in as few as two or three sessions," Belgarde reveals. Whether in a physical, occupational, mental, or emotional context or capacity, equine-assisted therapy has also been witnessed to improve issues with self-awareness, self-control, self-esteem, interpersonal relationships, empowerment, relaxation, and general happiness. "It's a truly fantastic process," adds Belgarde, wrapping up, "and I'd urge anyone interested in equine-assisted therapy, whether for themselves or a loved one, to pursue the options available to them." KNOTTSVILLE, Ky. (AP) — About 35 equine specialists and mental-health professionals from several states gathered at Lanham Family Farm in Knottsville to train in an Equine Assisted Growth and Learning Association workshop. Dubbed Eagala for short, the worldwide program incorporates horses in psychotherapy. Horses pair well with humans in therapy for many reasons, said Misty Baker of Daviess County. Baker, an equine specialist who is certified in the Eagala model, operates The Bridges Program, which uses horses in therapy. She contracts with two local mental-health professionals, who also are certified in Eagala methods. As Baker explains it, horses are prey animals. Humans are predators. For that reason, horses constantly assess humans when they make contact. "They immediately start to read your body language," Baker said. "They tend to pick up on the undercurrent of the unspoken things we bring into the arena." Much like bearing a physical load on their backs, horses take on their clients' emotional trauma, she said. Some of her horses have needed downtime after a session because the projected pain was so great. Equine-assisted therapy is a hands-on method that leans heavily on the concept that people learn best by doing. Baker has nine horses. During the first session, she and the client enter an arena or field with the herd. Then, one or more horses select the client — not the other way around. Clients never ride the horses. Therapy takes place face-to-face at ground level. Each session includes the client, horse, equine specialist and mental-health professional in the arena together. "Horses mirror us," said Lura McElhearn, a certified drug and alcohol counselor who is one of two therapists who work with Baker at The Bridges Program. Horses are masters at reading body language and respond to nonverbal cues clients send in much the same way their spouses, children and co-workers react. "The horses become very real symbols of these relationships and allow clients the opportunity to work through how to change these aspects of their lives in an experiential, in-the-moment and emotionally safe method," an Eagala handbook said. McElhearn said equine therapy helps clients who suffer from post-traumatic stress disorder, addiction, domestic abuse and autism, to name a few. Sometimes, juvenile clients are court-ordered to attend equine-assisted therapy. The Bridges Program offers hour-long sessions for individuals and families. Group sessions generally last 90 minutes.